Since there are 11 books in the series so far (with a 12th being published in March 2014) and I'm somewhat binge-reading them all, I thought it would be easiest to group the books and do mini-reviews. Summary: Six Warrior Vampires. Lovers, Fighters, Brothers. Lethal, not Evil, they're coming for you. 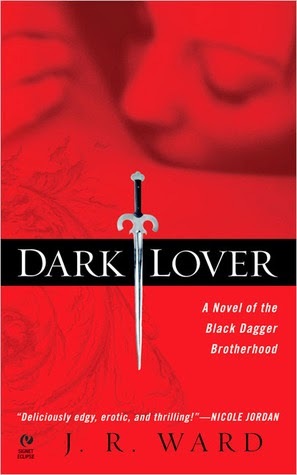 There’s a deadly war between vampires and slayers and only way the vampires can fight back is through The Black Dagger Brotherhood. They are a special group of warrior vampires trained to protect their race and lead by Wrath, the only purebred vampire left. When one of his brothers, Darius, asks him to protect his half-breed daughter, Beth (who has no idea she’s half vampire), Wrath refuses. But then Darius is mysteriously killed and Wrath has no choice but to honor his request and help Beth figure out who and what she is. Hands down, Wrath and Beth, was my favorite part of the book. And I have a feeling that for each book, this will be case as I get to know each brother and their heroine. Which doesn’t bother me one bit because the romance (and the brothers) here - one word, SWOON. Wrath and Beth fall hard and fast for each other and while I was bit surprised by how quickly their relationship moved, I enjoyed it a lot. I will say that I had to readjust my expectations a bit after reading this one. 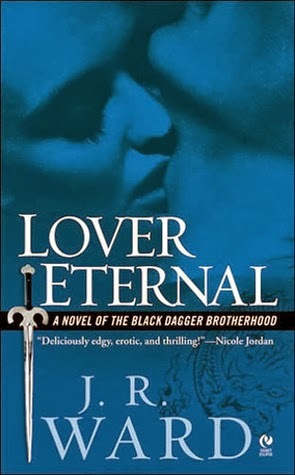 These books have a mythology of their own (I like the author’s take on vampires!) but I think the focus is more on romance and each brother’s character development. Which again, not a problem for me because even though the vampire lore is interesting, it’s not as interesting as the characters themselves. Plus.. dammit, I want the romance. Rhage is one of the strongest brothers (granted, this could probably be said of all of them) but there’s something different about Rhage. He’s cursed by the Scribe Virgin (their goddess) for something he did hundreds of years ago and turns into a beast / dragon when his anger and aggression take too much control. It’s painful for him and all those around him because every time he changes, he puts everyone in danger. But it also makes him a fierce opponent. Mary Luce, just a regular human with struggles of her own, accidentally gets pulled into the brotherhood when she befriends John Matthew, a boy with yet unknown ties to these vampires. Rhage is smitten with her from the moment he sees her but Mary is adamant that his feelings for her aren’t real. Her struggles have made her insecure and wary of love (but this never got annoying) and I understood why she had trouble reading him. But the truth is, his feelings are real (and hot) and he spends a lot of time trying to convince her. There’s a lot more tenderness in this relationship as Mary tries to understand his world and inadvertently calms the beast inside him. The infamous Z. When I talked about finally reading this series, he was the brother everyone (particularly Kelly!) raved about the most and I was more than ready to find out why. And ladies, I totally get it. It’s funny how getting a book from his perspective completely changed my view of him. Previously, we mostly saw that he was a sadistic hothead with a tragic past as a former blood slave. Then in Love Eternal, we get a tiny glimpse of his psyche which is more damaged than anyone realizes. And in Lover Awakened, we see it all. The good, the bad and the ugly. But a lot of good. A side which is brought out by Bella, a beautiful vampire who has her heart set on Z. When she’s captured by a Lesser (those who lead the slayers; this was also the first time I found myself intrigued by these evil characters), Z can’t stop thinking about her and how to save her. Obviously, Bella is found (or else there would be no story!) but the book is about more than her abduction. It’s about her post-traumatic stress, revenge, love, healing wounds - her own and Z’s. I’m writing this review having already read up to Book 6 and I have to say, I find Bella and Z’s relationship to be the most beautiful and compelling one yet. There was something so gratifying in watching Bella break down Z’s walls little by little. He’s so misunderstood and deserves happiness. They both do. Make sure to check out the rest of the posts! I must say that Wrath and Beth are probably my all-time favorite Black Dagger couple, as of the moment, with Z and Bella a close second. I just loved seeing their relationship form in the first book, and witnessing glimpses of it as the series goes on. Nice job summarizing your thoughts, by the way! I wish my reviews were as concise and precisely detailed (plot-wise) as yours are. It makes me so happy that we're both enjoying this series!